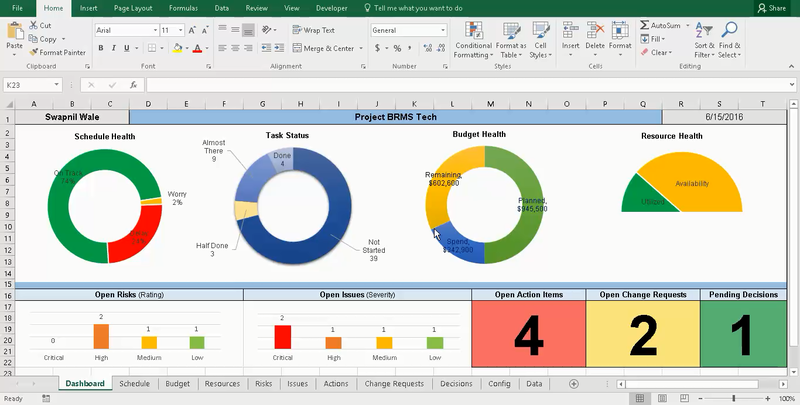 If you are looking to generate a quick report with a button click then you can use Microsoft Project report to generate a report which has the following information - Project Key Parameters, Key Tasks, Project Phases Remaining Work, Late Tasks and Resource Work Load. 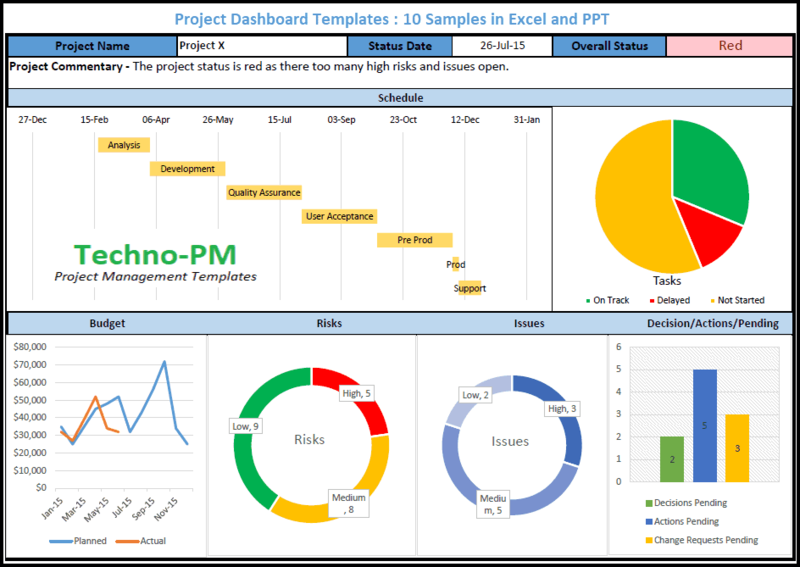 Preparing a project status report with word or excel takes time as you will have to gather the relevant information and then update the report. Project Name, Project Start and Finish Date. % Complete - an overall progress indicator. Status - Status indicator for the entire project - can be Late, On Schedule or Future Task. Cost - Estimated cost of the entire project. Based on the rate set for resources. Actual Cost - Cost incurred on the project till date. Calculated from the amount of work completed. Remaining Cost - The remaining cost of the project. 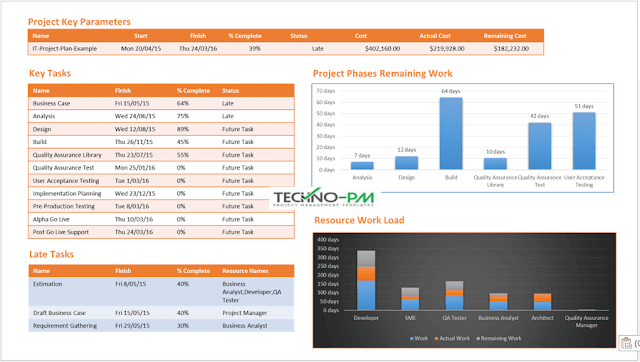 The Key Tasks section contains information about the summary tasks or key project phases. The details included are task Name, Finish Date, % Complete and Status. The Status can be On Schedule, Late or Future Tasks. This section of the report will help the readers understand how much work is left in each of the key phases of the project. You can choose to filter some of the phases. This section will give the project manager and stakeholders a picture of how much needs to be done and can help in understanding if the remaining time and resourcing are enough to complete the project in time. The resource workload report gives an idea about the workload for each of the resources. You may choose to filter some resources like managers and architect who are not full time on the project. The graph shows 3 different values - Work (Assigned Work), Actual Work (Work Completed so far) and Remaining Work (work to be done). 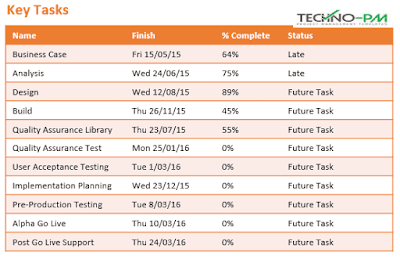 The late tasks report displays the tasks which are late. The report has task Name, Finish Date, % Complete and Resource Names. 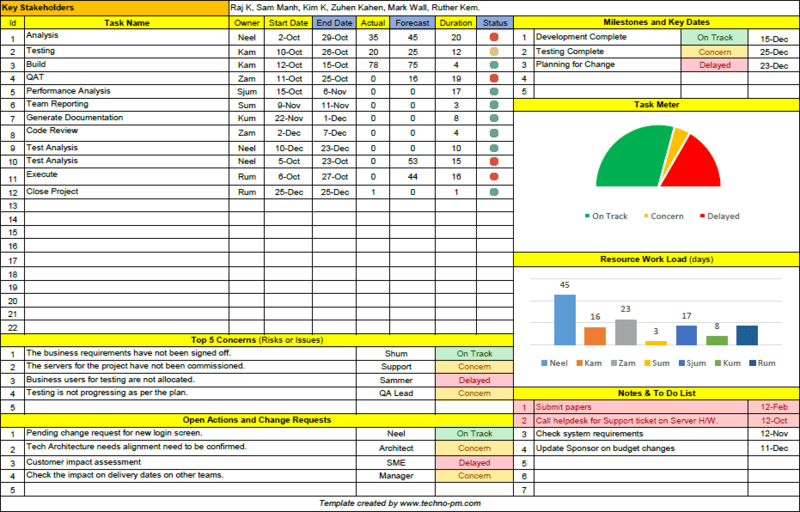 The late tasks report is very handy as it points which tasks are delayed and which resources are working on the late tasks.